Sprout Social is excited to announce our new Engagement Report, designed to help you understand, measure and improve your social media responsiveness. These metrics will help you find opportunities to better manage workflow and allocate proper resources for unrivaled social care. This feature is included in our Corporate and Enterprise plans but is available on all plans for a limited time. Sprout’s new Response Rate metric shows how well you’re responding to messages likely in need of response. Identify gaps in coverage and build an army of customer service heroes with our new ‘Average Response Time’ metric. Expose trends in engagement by day & time and see how you stack up against similar profiles. 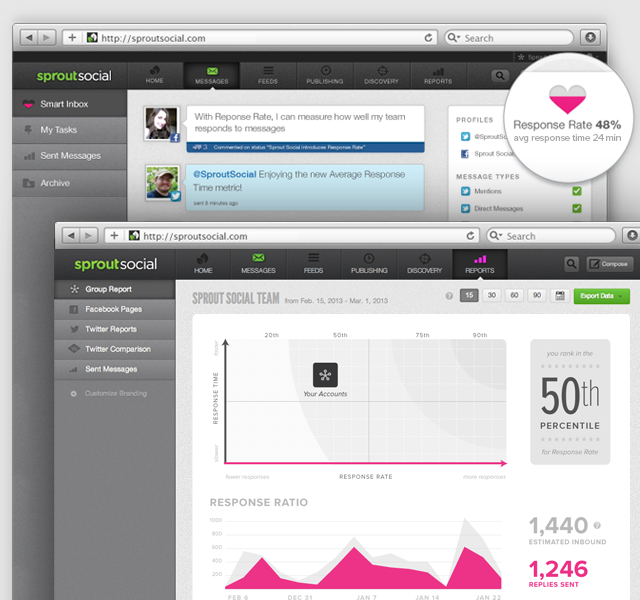 Along with the Engagement Report, Sprout is introducing the Reponse Rate indicator to the Smart Inbox. This provides a quick and easy way to keep a pulse on your performance in real-time while in your daily workflow. Finally, get a peek into your past week’s or month’s performance with your response rate metrics conveniently placed on your dashboard. If you know any friends or colleagues who haven’t yet experienced the beauty of Sprout, share it on Twitter and give them the opportunity to generate a free Engagement Report at MustBePresent.com. Keep an eye out for more announcements from the Sprout Social team and, as always, contact us for questions or assistance. Thanks for using Sprout!